More than a third of us are unable to recognise the people we live next door to. But can new technology resurrect some good old fashioned neighbourliness? Kate Wills puts the latest neighbourapps to the test. It’s 7pm on a Friday night and I’m putting the finishing touches to my signature dish – a pumpkin risotto – when the doorbell rings. I feel my heart speed up as I open the door to Alex. We’ve never met before and as we say hello, he goes for a kiss on the cheek when I was offering a handshake. Awkward. I blurt out an offer of an Aperol Spritz, take his jacket and scarf and then smooth my hands down my apron. He’s got spiky blonde hair and has that trademark twenty-something perkiness. This isn’t a friend of a friend who’s turned up early to my dinner party, or even (god forbid) a deeply intense first Tinder date. I’ve got ten people coming over for supper tonight, and all of them are strangers. In fact, the only thing I know about any of them is that they live near me and are willing to pay Â£8 a pop for a plateful of my home-cooked stodge. This is the concept behind Menu Next Door, a new website which aims to link up enthusiastic home cooks with their enthusiastically hungry neighbours. Like most people who live in a city in 2017, my relationship with my neighbours is not exactly Ramsey Street. I’ve lived in the same block of flats in south-east London for three years, and while I’m on nodding terms with most people I pass in the identikit white corridors, that’s about the extent of it. The only real sense of community spirit stalking this place is passive-aggressive notices in the lifts about fly tipping. It wasn’t always like this, of course. On the quiet suburban street in Surrey where I grew up, my sister and I would play 40-40 with the kids next door until our lungs hurt. Psychologists call this kind of interaction with our neighbours “social capital” and it has very tangible effects. Numerous studies have shown that people who feel they can trust their neighbours report better health and live longer. Having a sense of community and strong social ties has also been linked to economic growth. Yet it seems we’re getting more and more isolated. 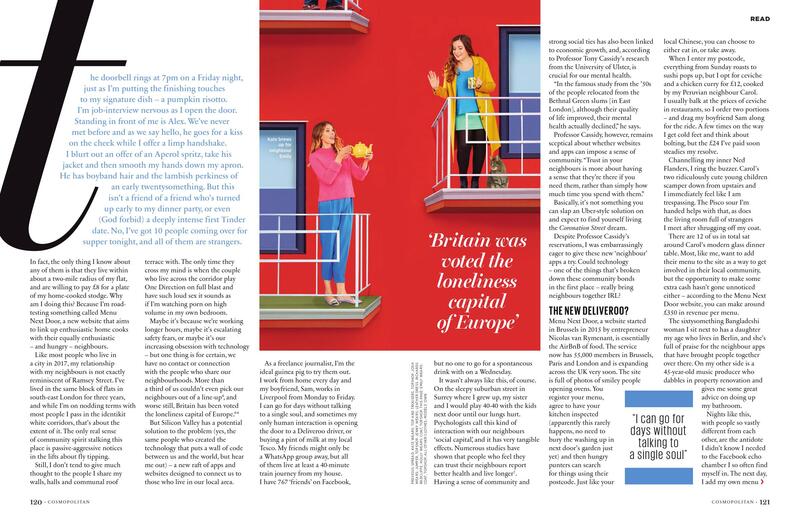 Britain was recently voted the loneliness capital of Europe, with 36% of people saying they’d like more social contact. *** And I’m one of them. Despite Cassidy’s reservations, when I saw just how many new apps promise to forge connections with the people in your immediate proximity, I was embarrassingly eager to give them a try. Could technology — the very thing that’s broken down these community bonds in the first place — really bring neighbours together IRL? As a freelance journalist, I work from home and my boyfriend Sam works in Liverpool during the week. Sometimes, my only human interaction is opening the door to a Deliveroo driver. Clearly one of the biggest reasons we’re no longer gossiping over the garden fence is that we’re all gossiping online instead. While my friends are only a WhatsApp group away, all of them live at least a 40-minute train ride from my house, which means that while I have 767 Facebook friends, finding someone to go for a quiet drink with on a Wednesday evening isn’t easy. Enter Menu Next Door, a website started in Brussels in 2015 by entrepreneur Nicolas van Rymenant, who realised that an “Air BnB with Food” could catch on. The service now has 55,000 members in Brussels, Paris and London and has plans to expand across the UK. The site is very simple to use (and full of smiley people opening ovens). Home cooks register their “menu” on the website, and have to fill in quite a long survey and tick a box saying they’re willing to have their kitchen inspected by the council (which apparently rarely happens). Then hungry punters put in their postcode to view the “Menus” nearest to their house. You can either pick up and eat at home, or “eat in” at an informal supper club. When I enter my postcode everything from Sunday roasts to sushi pops up, but I opt for ceviche and a chicken curry for Â£12, cooked by my Peruvian neighbour Carol. I usually baulk at prices in restaurants, so I order two portions (dragging boyfriend Sam along) and pay by credit card (you can also pay in cash on the night). Turning up at Carol’s house that night feels a bit like arriving at a party you’ve not really been invited to. A few times on the way I get cold feet and think about bolting, but the Â£24 I’ve paid and the thought of a tasty dinner steadies my resolve. Channelling my inner Ned Flanders (“Hi di hi neighbouroonies!”), I ring the buzzer. Carol’s flat is very modern and full of people I’ve never met before. But because we’re all in the same boat, conversation is surprisingly un-stilted. It’s either that or the fact we’ve all been given a Pisco Sour to sip on. 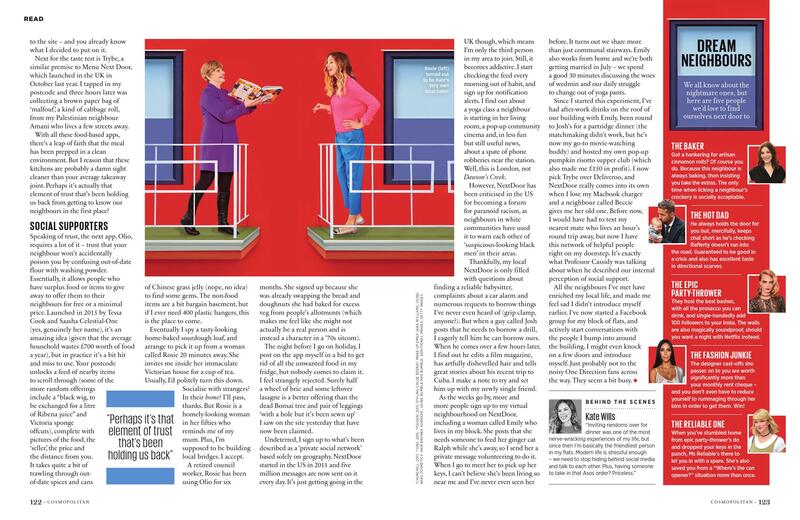 As the 12 of us chat in Carol’s living room, her two ridiculously cute young children scamper down from upstairs. It’s feels a bit like I’m trespassing in someone’s living room. Because I am. Most of the people I meet are considering cooking for the site themselves as a way to get involved in their local community and also to make some extra cash. The MND website states that the average cook makes Â£350 in revenue per menu. As we squeeze in to eat our ceviche at Carol’s big glass dining room table, I find myself sitting next to a 60-something Bangladeshi woman whose daughter is my age and lives in Berlin (which apparently has a lot of food sharing apps). I also end up chatting to a 45-year-old music producer who dabbles in property renovation so he gives me some advice on doing up my bathroom. Making connections like this and hearing different views on everything from Trump to the latest rail strike is really rewarding. I often feel like I live in the Facebook echo chamber, so it’s refreshing that the neighbours around Carol’s table have such different life experiences to me. Carol tells me she served over 30 portions that night, which inspires me to have a go at my own Menu Next Door event, too. The app TRYBE launched in the UK in October and operates a similar service to Menu Next Door. I tapped in my postcode and three hours later was collecting a brown paper bag of “Malfouf”, a Palestinian cabbage roll from my Palestinian neighbour Amani who lives a few streets away. With all these food-based apps there’s a leap of faith that the meal has been prepped in a clean environment. But I reason these kitchens are probably a damn sight cleaner than your average take-away joint. Perhaps, it’s actually that element of trust is what’s been holding us back from getting to know our neighbours in the first place? Next I download an app called Olio, for people who have surplus food or items to give away to their neighbours. Started up in 2014 by Tessa Cook and Saasha Celestial-One — it’s an amazing idea (given that the average household wastes Â£700 worth of food a year), but in practice it’s a bit tricky to use. Entering my postcode brings up a feed of nearby items to scroll through, complete with pictures of the food and the “seller”, the price (most are free or very cheap) and distance from you. It takes quite a bit of trawling through out-of-date spices and cans of Chinese grass jelly (nope, no idea) to find some gems. The non-food items are a bit bargain basement, but if I ever need 400 plastic hangers – this is the place to come. Eventually I spy a tasty-looking home-baked sourdough loaf, and arrange to pick it up from a woman called Rosie who lives 20 minutes away. I’d expected a cursory exchange on the doorstep but instead she invites me inside her immaculate Victorian house for a cup of tea. Rosie is a homely-looking woman in her sixties with curly hair and glasses who reminds me of my mum. Olio allows you to see a profile picture of the person before you commit, and it does cross my mind whether I’d be so keen to go inside if I was collecting from the slightly-scary looking bloke who was peddling a half-eaten box of crackers (#nojudgement). Rosie is a retired council worker and has been using Olio for six months. She signed up because she was already swapping the bread and doughnuts she had baked for excess veg from people’s allotments (which makes me feel like she might not actually be a real person and is instead a character in a 1960s sitcom). Although Rosie says she uses the app because she loves baking, I get the sense she loves the company just as much. And that’s a two-way feeling. It’s incredibly rewarding to meet someone who’s lived in my area for 30 years and I come away with a tasty loaf of bread, the number of a good local plumber and a promise to check out a new French restaurant that’s recently opened near me. The night before I go on holiday, I post on the app myself in a bid to get rid of all the unwanted food in my fridge, but nobody comes to claim it. It sounds silly but I feel a bit rejected. Undeterred, I sign up to what’s described as a “private social network’ based solely on geography. NextDoor started in the US in 2011 and 5 million messages are now sent on it every day. It’s just getting going in the UK though, which means I’m only the third person in my area to join. And joining is not that easy — you have to verify your address (they post or text you a code) and create a profile by uploading a picture. As the weeks go by I feel strangely thrilled when emails pop into my inbox alerting me that “Walid”, “Sam” and “Natalie” have also signed up. I start checking the feed every morning out of habit, and sign up for notification alerts when there’s a new post. Through NextDoor I find out about a yoga class a neighbour is starting in her living room, a pop-up community cinema (and, in less fun but still useful news) about a spate of phone robberies near the station. Well, this is London, not Dawson’s Creek. Interestingly, NextDoor has been criticised in the US for becoming a forum for paranoid racism, as neighbours in white communities have used it to warn each other of “suspicious-looking black men” in their areas. Thankfully my local NextDoor is only filled with questions about finding a reliable babysitter, complaints about a car alarm and numerous requests to borrow things I’ve never even heard of (A grip clamp, anyone?). But when a guy called Josh posts that he needs to borrow a drill, I eagerly write him a message saying he can borrow ours. When he comes over a few hours later, I find out that Josh edits a film magazine, has artfully dishevelled hair and tells great stories about his recent trip to Cuba. I make a note to try and set him up with my newly-single friend. As the weeks go past more and more people sign up to my virtual “neighbourhood” on NextDoor, including a woman called Emily who lives in my block. She posts that she needs someone to feed her ginger cat Ralph while she’s away so I send her a private message volunteering to do it. When I go to meet her to pick up her keys I can’t believe she’s been living so near me and I’ve never even seen her before. It turns out we share more than just communal stairways. Emily also works from home and we’re both getting married in July so we spend a good 30 minutes discussing the woes of wedmin and our daily struggle to change out of yoga pants. Since I started this experiment I’ve had after-work drinks on the roof of our building with Emily, been round to Josh’s for a partridge dinner (the matchmaking didn’t work, but he’s now my go-to movie-watching buddy) and hosted my own pop-up pumpkin risotto supper club (and made Â£150 in profit). TRYBE is now my go-to over Deliveroo, and although I don’t check NextDoor as much as Facebook, I still occasionally browse. It really comes into its own, though, when I lose my Macbook charger and a neighbour called Beccie gives me her old one. Before now, when things like that happened, I would’ve had to text my nearest mate who lived an hour round-trip away, now I have this network of helpful people right on my doorstep. It’s exactly what Professor Tony Cassidy was talking about when he described our internal perception of social support. All the neighbours I’ve met so far have seemed like genuinely lovely, thoughtful people who I feel sad I didn’t introduce myself to earlier. It’s encouraged me to start a Facebook group for my block of flats and it no longer seems weird to start conversations with the people I bump into around the building. I might even knock on a few doors and introduce myself. Just probably not the One Direction fans across the way. They seem a bit busy.